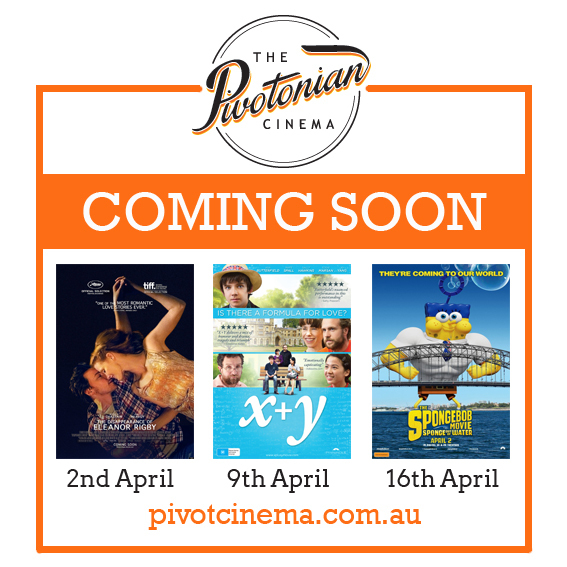 Following on from our award-winning films CITIZEN FOUR, HUMAN CAPITAL and ROSEWATER The Pivotonian Cinema has three more big films coming your way. And not to mention current screenings of ELSA & FRED, THE DARK HORSE and the hilarious WHAT WE DID ON OUR HOLIDAY. We are proud to announce that we are one of the few cinemas that are screening THE DISAPPEARANCE OF ELEANOR RIGBY in both HIM and HER versions; bringing you both feature-length films just as Director Ned Benson intended. These films can be viewed independently of each other or together, in random order. Next, from April 9th we have the heart-warming Comedy / Drama X+Y featuring the lovely Sally Hawkins and Rafe Spall. And then, spear-heading our next program is the new SPONGEBOB movie SPONGE OUT OF WATER on April 16th.